Everyone should have their water tested for bacteria, nitrate, and lead when they move to a house with a private well, and at least every few years after that. Although other contaminants have the potential to contaminate your ground water as well, bacteria, nitrate, and lead are the most common and can be tested for a reasonable cost. Testing for those three ranges from a few dollars up to $30 or so (each parameter) in some labs, while testing for pesticides is likely to cost more. If you are on a public water system ("city water"), the water system is required to test the water regularly. In general, you should not need to test the water yourself. If you live in an older home and suspect lead from your house’s piping may be contaminating the water, or have other reasons to suspect contamination, consider testing. The Indiana State Department of Health Laboratory (ISDH) will test private well water samples for the following parameters. The cost is $10 for bacteria, fluoride, or nitrate, and $20 for the lead, copper, and arsenic test, plus $6.50 shipping and handling. Bacteria - To determine if the water is bacteriologically safe for drinking purposes. Total Nitrate-Nitrite: Nitrate is particularly a concern for infant feeding because infants are sensitive to nitrate. It is often used as a first test, particularly in agricultural areas, to see if any contamination is present. Metals: Lead, copper and arsenic testing, which is a good idea in any home that may contain lead pipes. (The metals test is $20 + shipping). 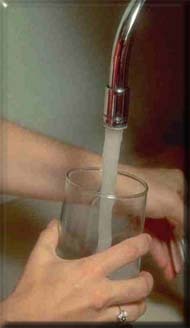 To have your water tested, you must use the "Water Test Kit Order Form" which is the last form listed at http://www.in.gov/isdh/24550.htm (A direct link to the form (pdf) is at https://forms.in.gov/Download.aspx?id=74). Fill out the tests you want in the Private Individual line. Enclose the fee (currently $10 per test plus $6.50 S&H) and mail to the address on the form. You will receive the test kit, which consists of sterile bottles, a mailer, and instructions for filling the sample bottle and mailing it back. Call 317-921-5874 for more information. To find Indiana laboratories that test for other contaminants, the most up-to-date source of information is maintained by the Indiana State Department of Health. At this web site, select "certified chemistry laboratories" to find labs that test for parameters such as copper, lead, mercury, nitrate, fluoride, pesticides and other synthetic organic chemicals, or volatile organic chemicals. Select "certified microbiology labs" to find labs that test for E. coli or other bacteria. We have collaborated in the past with Heidelberg College Water Quality Labs (now called the National Center for Water Quality Research) to test private wells in Indiana for pesticides, metals, nitrates, and other contaminants. Prices are listed at the bottom of this web page. You may wish to contact them about their testing program. "Do-it-yourself" water test kits are also available at stores. We do not have additional information on the reliability of these tests beyond what is provided by the manufacturer. Since they are very low-cost, they may serve well as a "screening test". The most reliable are likely to be the kits where you pay a fixed price ($10 to $15) for a kit that includes testing at a certified laboratory. If your well tests positive for bacteria, one recommended solution is to shock chlorinate the well and plumbing systems. Follow this informative guide on well disinfection from IDEM. Then have your well water re-tested.